EPA provides public notices about regulatory and other actions it takes, often related to its permitting authorities. Many public notices seek comment (e.g., proposed EPA actions) or participation from the public (e.g., public meeting notice); some are for informational purposes only (e.g., announcing a final report). EPA strives to include direct links to all EPA public notices on this site but in some cases that is not feasible. If you do not find what you seek in the full search listing, use the additional tools below to aid your search. For a state-specific listing, choose a state or territory from the map below, or from the dropdown list. 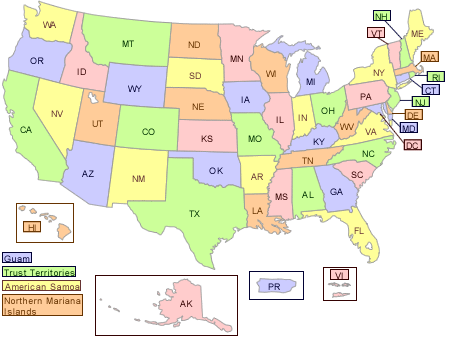 For individual states, click the state on the map at left. On the resulting page, click the RSS icon at its lower-left corner. For other subsets of the searchable listing, go to the listing, filter it as desired. On the resulting page, click the RSS icon at its lower-left corner. When you have the feed page you desire, it should contain instructions for subscribing. This differs, depending on the browser being used.